In November 2008, Bush was hospitalized for abdominal pains. She had surgery on her small intestine. Bush underwent aortic valve replacement surgery in March 2009. On April 15, 2018 it was reported by a source close to the Bush family that Barbara was in "failing health". She decided to have only "comfort care", which is placing end-of life patients under comfort care until they die. She chose to be at home with her family rather than go back to the hospital for treatment. She suffered from chronic obstructive pulmonary disease, congestive heart failure (COPD) and Grave's disease. Bush died on April 17, 2018 in Houston of complications from COPD and congestive heart failure at the age of 92. She was buried at the George Bush Presidential Library in College Station, Texas on April 21, 2018. ↑ "Barbara Bush 'Beautiful Mind' Quote". snopes.com. Retrieved 2014-01-11. ↑ "Barbara Bush: Things Working Out 'Very Well' for Poor Evacuees from New Orleans". Editor and Publisher. September 5, 2005. Archived from the original on 10 April 2007. Retrieved 2014-01-11. ↑ "Barbara Bush comments on survivors spark outrage". Sydney Morning Herald. September 7, 2005. Retrieved 2014-01-11. ↑ CYNTHIA LEONOR GARZA, Copyright 2006 Houston Chronicle (2006-03-23). "Katrina funds earmarked to pay for Neil Bush's software program – Houston Chronicle". Chron.com. Retrieved 2014-01-11. ↑ "Former First Lady Barbara Bush In Hospital". Fox News. 2010-04-07. Retrieved 2011-11-17. ↑ Snyder, Whitney (November 20, 2010). "Barbara Bush Jabs Sarah Palin: 'I Hope She Stays' In Alaska (VIDEO)". Huffingtonpost.com. Retrieved 2014-01-11. ↑ "44 – Palin fires back at 'blue-blood' Barbara Bush". Voices.washingtonpost.com. 2010-11-24. Retrieved 2014-01-11. ↑ "Former First Lady Barbara Bush In Hospital". Fox News Channel. April 7, 2010. Archived from the original on March 3, 2009. Retrieved November 17, 2011. ↑ News, U. S. "Former first lady Barbara Bush hospitalized for 'respiratory related issue'". U.S. News. ↑ Domonoske CAMILA DOMONOSKE, Camila (2018-04-18). "Former First Lady Barbara Bush In Failing Health, Not Seeking Further Treatment". www.npr.org. Retrieved 2018-04-19. ↑ Jamie Gangel (April 15, 2018). "Exclusive: Barbara Bush in failing health". CNN. Retrieved April 15, 2018. ↑ Graczyk MICHAEL GRACZYK, Michael (2018-04-15). 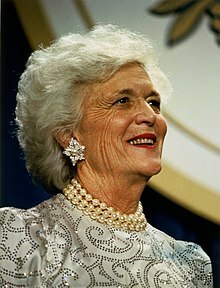 "Spokesman: Former first lady Barbara Bush in failing health". ABCNews.go.com. Retrieved 2018-04-15. ↑ Hutchinson, B. and Nestel, M. (2018). Former first lady Barbara Bush dies at age 92. [online] ABC News. Available at: http://abcnews.go.com/US/lady-barbara-bush-dies-age-92/story?id=54490037 [Accessed April 17, 2018]. ↑ PM, Joe Difazio On 4/17/18 at 7:53 (17 April 2018). "Barbara Bush is dead at 92 after struggling with several illnesses". Newsweek. ↑ Schallhorn, Kaitlyn (18 April 2018). "Barbara Bush's funeral attended by Melania Trump, Clintons, others". Fox News.